The Scouting program is designed to serve youth, but adults involvement is one of the most important points. The “Scout Shirt” example in the “Orientation for New Boy Scout Parents” and representing the Scouting program as the Scout Shirt, where boys like the “showy” side of the shirt including all the colorful badges, ranks and awards, the adults’ eyes “should not be distracted by the colors and the designs, by the showy stuff” but we should look deeper than the shirt and care more about the boy inside this shirt, his character development, citizenship and physical and mental fitness. From the same guide, where adults are represented as the hiking stick and how youth need us through their journey, the need here is more than a person who signs off the requirement. Boys learn a great deal by watching how adults conduct themselves. Scout leaders can be positive role models for the members of the troop. In many cases, a Scoutmaster, a merit badge counselor, or one of the troop parents who is willing to listen to boys, encourage them, and take a sincere interest in them can make a profound difference in their lives. 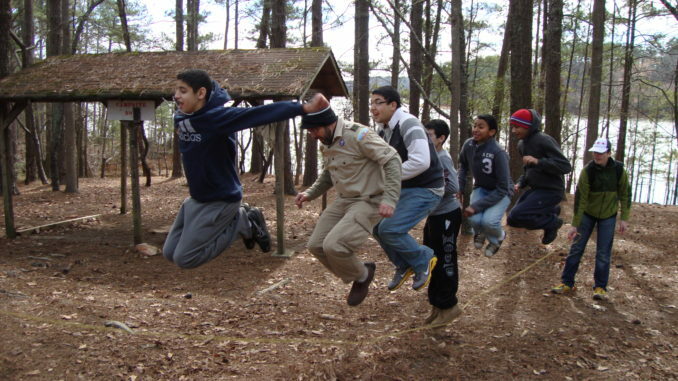 The Scouting program emphasizes helping young men develop character, citizenship, and mental and physical fitness. Among the handful of methods used to build on these aims of Scouting are adult association, leadership development, and advancement. Besides parents and relatives, school teachers, religious leaders, and possibly coaches, most Scout-age youth don’t have much contact with many other adults or professionals. A Scout’s association with his merit badge counselors provides an excellent way for him to grow and gain confidence through exposure to quality adults who serve as positive role models and mentors. Meeting people from business and community leaders to trained specialists and enthusiastic hobbyists, a Scout can experience personal growth and a positive life-altering experience while in pursuit of a merit badge. If we added to this the “Mail Box” example from the Unit Commissioner training, where the youth are represented by a mail box, receiving messages only when they are ready to receive one. The scouting activities like camping, hiking, merit badges, camp fire and all of these fun things, or even in situations when things are not running as expected, are just to let this mail box be ready to receive messages. Adults need to be there to deliver values and guidance to the youth until one day they themselves start to open the mail box and raise the flag as ready to deliver to younger kids. All of these came to my mind after spending a few days with my son at Bert Adams for a Winter Camp, one of the badges he attended was the Bugler Merit Badge, the Counselor told them his story and how he taught himself to play the bugle, a boy in his troop was interested in learning it and he decided to learn it so he can teach it to kids. It took him almost 2 years and now he is a registered Merit Badge Counselor and ready to serve, he also served as a Bugler during the camp’s flag ceremonies, but still learning and practicing. For me this story, plus his patience teaching the kids with a smile and other fun stories about the bugle’s history is what is more important than the skills the kids can learn in 4 hours. I enjoy to be there with my kids selling Camp Cards, to remind them that a “Smile is a Charity” as Prophet Mohammed PBUH (peace be upon him) mentioned. Adults coming out of stores and buying the cards or even donating, open an opportunity for me to discuss with my kids why someone came to them with their money even before they know what a Camp Card is, why sometimes they donate without even taking the camp cards, what can be the reason for paying someone they don’t know. It is an opened Mail Box opportunity, hoping to see my kids in the future giving back allowing another parent to show his child how to be cheerful and kind. I also like to mention the story of Prophet Mohamed PBUH and how he recruited Abu-Bakr when talking to the kids about the Recruiter Badge, how he was looking for the best and not just a number. As adults in scouting units we need to do the same, recruit adults to serve as positive role models before serving as Committee Members or Merit Badge Counselors or any other position. Because it is not about the Eagle Rank, it is about the values the kids learn from us while working on their advancements, while having fun and building memories. Doing a Scoutmaster conference or a Board of Review over the phone, skype or sending requirements by email are all accepted but should be allowed in very limited situations, where face to face cannot happen. Advancements in Scouting is a method, but eliminating the Adult Association which is another Scouting method is like an incomplete diet, an effort without the full benefits. About Osama Mourad: Started scouting as a Cub Scout at The Holy Family School in Egypt in the 5th grade, stayed in scouting until he became the Assistant Crew Leader. Served as Assistant Scoutmaster, Advancements Coordinator for Troop 12 and Cubmaster for Pack 12. Now a Den Leader, Troop Training Coordinator and Unit Commissioner. On point and very well written! As adult leaders we can sometimes miss the point of scouting when we get bogged down with technical details related to the requirements. Thanks for another eye opening and inspiring article! Great Article. Scouts is very much needed work these days . Where parents guidance is limited and adults are always busy. Keep up the great job.